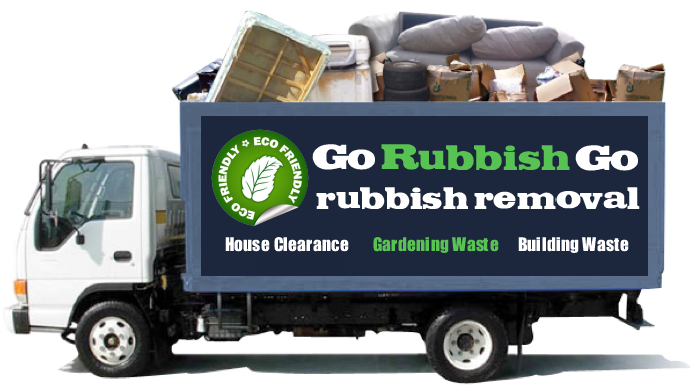 If you need help clearing space and disposing of the waste that has accumulated in your property in Canary Wharf, give Go Rubbish Go. a call today! We offer E14 waste clearance services to cater for all of your rubbish clearance needs. 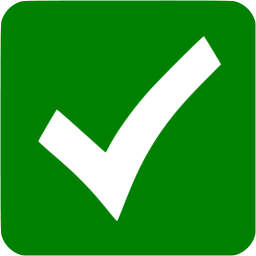 To name just a few, these include: property clearance, office clearance, garden waste clearance and flat clearance. When you hire our Canary Wharf rubbish removal services, you are provided with skilled staff, an appropriate method of transport to carry your waste, and proven disposal methods. Our staff members are fully trained to carry and load your junk items and will always go to the necessary lengths to leave you with a clear space, ready for you to do with as you please. We work hard to make sure that our methods are fast and effective, so that there is no need to keep you waiting around. Besides providing a speedy, efficient Canary Wharf waste removal, we make sure that our prices are the lowest in the E14 and E1 areas, to ensure that our customers are receiving the absolute best possible value for money from our service. If you’re interested in high standards of rubbish clearance in Canary Wharf, E14 at a low cost, give us a call now on 020 8610 9182 to book an appointment! Don’t waste money on other waste disposal methods, our Canary Wharf rubbish removal services have it all covered! 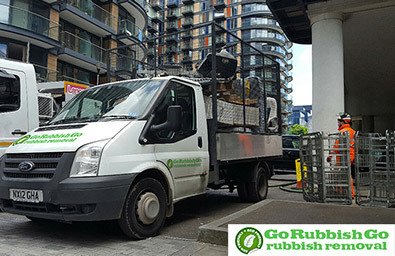 Hire Go Rubbish Go.’s waste collection in Canary Wharf and save yourself money as well as time and effort! 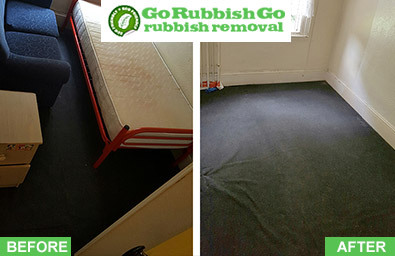 By hiring our rubbish removal service in the E14 area, you not only benefit from the skills and extensive help of our staff members, but you also get all of the necessary equipment to execute an efficient waste disposal. With us, there are no hidden costs and our entire service – from start to finish – is included in one low price. Hiring our waste disposal E1 will save you money that would otherwise have been wasted on skip hire and a skip permit. No other waste removal in Canary Wharf or anywhere in E14 has such trustworthy workers or such low rates. 5-star service all the way! We Make Waste Collection In Canary Wharf Easy! We try our best in everything we do to ensure that our services exceed those of all other waste collection companies, and that we provide such a brilliant Canary Wharf waste removal service at an incredibly low price. So why waste your time or money going to anyone else? Call 020 8610 9182 today for more information about the extensive range of services we provide, or for a free quote based on your specific circumstances. Book now for our lowest ever prices! 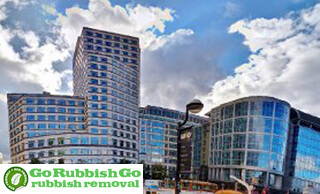 We employ only the very best rubbish disposal Canary Wharf specialists, and we ensure that they all undergo a rigorous and extensive training regime to guarantee that every time you call 020 8610 9182 you will be receiving the very best service in Canary Wharf, from talented, enthusiastic, and friendly staff who aren’t shy to drop you a hint or two to make your Canary Wharf waste removal job easier in the future. We are all about helping our customers at every level, from the experts in our office to the experts in the field. We will always put your needs first and will do everything we can to ensure that our service is perfectly suited to your needs. Call 020 8610 9182 today and hire our highly skilled professionals! Canary Wharf is a district in London, located in the borough of Tower Hamlets. The area boasts two big shopping malls with a wide selection of well-known high street shops along with smaller designer boutiques. The majority of shops in these malls are open until late in the evening, seven days a week, so that locals and visitors are able to shop whenever they need. Apart from a great selection of shops, Canary Wharf also offers a wide selection of restaurants and bars too, including: Smollensky’s, All Bar One and Carcluccio’s. Canary Wharf is well known for its famous skyline. It is home to many exceptionally tall buildings, including the tallest one in Britain – One Canada Square. Other skyscrapers in the area include the HSBC Tower and the Citigroup Centre, which are visible from miles away due to their exceptional height.